The robbery at Norrmalmstorg in 1973 took an unexpected turn when the hostages started sympathizing with their captors. In an instant the Stockholm Syndrome was born. Early habitat dioramas and home of the elusive gaff, the skvader. 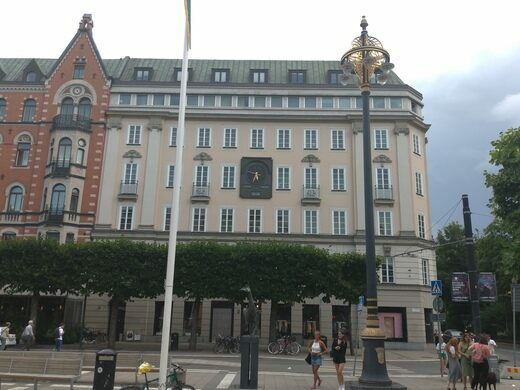 The corner at the intersection between Norrmalmstorgsgatan and Hamngatan in Stockholm was once the location for one of Kreditbanken’s (The Credit Bank) offices. On an August day in 1973, Jan-Erik “Janne” Olsson, on leave from prison, went into the bank armed with a submachine gun and tried to rob it. The police were on the scene right away and two officers went inside. Olsson opened fire, injuring one of them in the hand and the jaw. He then ordered the other policeman to sit in a chair and “sing something.” He chose Lonesome Cowboy by Elvis Presley. Olsson took four persons in the staff hostage and barricaded himself in the vault. He demanded that his friend Clark Olofsson, at the time imprisoned, be brought there and his demand was met. A few days into the robbery attempt, the police drilled holes through the wall to the vault to take pictures. Olofsson fired his gun at the forensic officers photographing the scene and wounded one of them in the face and the hand. He threatened to kill the hostages if any attempts to release gas into the vault were made, and he now and then forced the hostages to stand up with slip knots around their necks so that they would be strangled, as insurance against these attempts. In the end, Olsson and Olofsson surrendered after half an hour and none of the hostages sustained any permanent injuries. During and after the attempted robbery, the hostages showed sympathy for the robbers and criticized the police for their actions. The Swedish Prime Minister talked with the offenders and the hostages during the drama and one of the latter defended their captors, saying that the police had opened fire first. Some of them also insisted that the robbers should get safe passage to the car that they had demanded. This behavior, unheard of at the time, stirred interest in the academic world. It was the criminologist and psychiatrist Nils Bejerot who was working for the police at the time that coined the expression “Norrmalmstorgssyndromet” (The Norrmalmstorg Syndrome). This later became known as Stockholm Syndrome. Stockholm's deepest subway station is also a stunning ecological wonder. The scars of a remarkably organized public protest to save 13 elm trees are still visible in this Stockholm park. A heated statue pays tribute to one of Sweden's great actresses.